Today we will discuss the use of used tea leaves in gardening. We all love tea. What better it would be if we can use those leaves after extracting the liquor and use it in the garden. Is tea leaves good for plants? Tea leaves are very rich in organic materials, disposing of them like trash is like throwing out valuable natural resource. Adding them to the compost pile will reduce the need of adding other fertilizers. They are a fantastic source of Nitrogen. After taking out the tea liquor, the remaining leaves can be used as a great source of nitrogen in the compost pile. It can be a good supplement to balance the brown materials (rich in carbon) of the compost pile. To know more about carbon-nitrogen balance check out our earlier article on composting ingredients. You can take out the leaves from the tea with a strainer. Store these along with your kitchen scraps. Once the bucket gets filled dump them into the compost heap and lets them decompose. 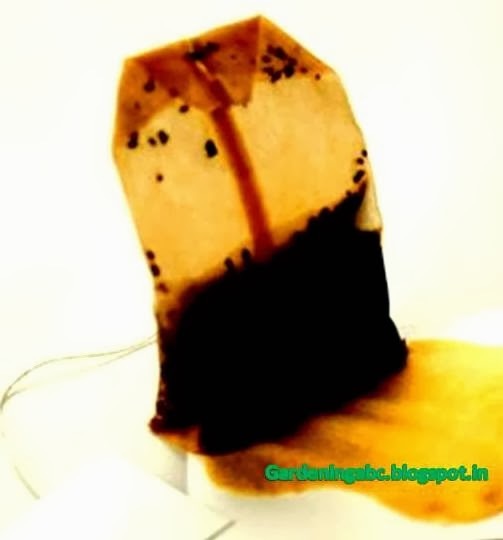 If you are using tea bags to prepare tea, you can use used tea bags as fertilizer and put them in compost pile. But while dumping the tea bags, cut them open and take the tea leaves out. Not all tea bags can decompose. In cases where the bags are made up of nylons, they will not do any help in composting. Some tea bags can be made up of paper or silk they will decompose but the rate will be very different from the leaves. That is why it makes sense to take out the leaves from the bags. Tea leaves can also be used as mulch. Unlike other kitchen scraps, they don’t need to be composted before applying as mulch. The leaves can hold water in large quantity. So don’t apply them if your garden soil is damp and your plant requires dryer soil. Tea leaves also protect the plant from many soil-borne diseases. It is a little acidic in nature so mixing with soil will decrease the pH of the soil, and provide an ideal growing condition for many plants. Tea leaves are rich potassium (K) and phosphorus (K) apart from Nitrogen (N), which are key elements in plant growth. They are beneficial for growing Mushrooms in particular. Tea leaves mixed with peat moss works wonder for Mushrooms. Apart from Mushrooms tea leaves have also shown good results in rose cultivation. Did you like the article? Share your views. Can one use tea leaves in which sugar is added ? i mean in normal Indian way of tea making we use sugar in the water is it safe to use such tea leaves? There is no problem with added sugar. Can one use tea leaves in which sugar and milk added ? i mean in normal Indian way of tea making we use sugar and milk is it safe to use such tea leaves?